If you are looking for a beautiful cabin with truly spectacular views, this is the place for you. 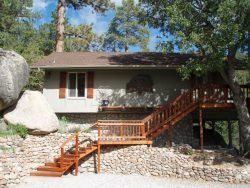 Located just couple miles above Idyllwild, in Fern Valley, this cabin offers all the beauty Idyllwild has to offer with enough privacy so you can truly relax. You enter on the mid-level into a large living room with a large wood burning fireplace and big cozy couches. A floor to ceiling window gives you a beautiful view while you are snuggling up to read a book or watching a movie. On this floor, there is also a dining room that seats 6 and a large, fully equipped kitchen. All the comforts of home make preparing meals in this kitchen a breeze. From the dining area, you exit onto the deck where you will have your breath taken away by the views. You can bar b q or just sit and enjoy a glass of wine while you watch the sun settle down for the night. Down the hallway, there is a bathroom with a very unique bathtub and the master bedroom with a big comfy queen size bed. Upstairs, there is a large loft with two twin beds and another bathroom. Hardwood floors and plenty of space make this a perfect place for the kiddos to camp out and play while mom and dad relax in front of the fire before bedtime. Down to the first level, there is a huge day room with another bathroom. The light in this room is perfect for nestling down on the couch to read a book or maybe sketching the beautiful view from the second lower deck. There is a large art desk if you are feeling creative and tons of room for kids to play games or possibly build blanket forts. The yard is not fenced but perfect for little ones to feel like they are really hiking in the mountains while still able to be seen by mom and dad. Trees for climbing, and lots of critters to be seen. Squirrels, bunnies, tons of birds, and even deer like to play on this property. When you come, don't forget your camera! Did I mention THE VIEWS?? ?